This high-rise project embodies infill with its great location, mix of uses and creative use of a speck of land. Aspen Lofts brings approximately 130,000 sq. ft. of housing and mixed use space to downtown Boise, all resting on 5940 sq. ft., helping to reduce sprawl and preserve open space. 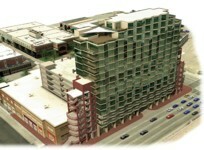 The Aspen is a mix of retail, office, warehouse, and condominium homes but is primarily condominium residential infill. The 75 new residences are within a 5 to 15 minute walk from all the employment and activities available in this regional city center. Aspen Lofts supplies a range of housing size in the growing downtown housing market, condominiums range from cozy 484 sq. ft. studio homes to posh 4600 sq. ft. luxury models. In addition to choosing the size of their home, residents are able to custom-design their floor plans. To implement Garden City’s recently adopted, award winning Comprehensive Plan, this overhaul of the Garden City Development Code assures the city will follow its 2006 Comprehensive Plan and develop using smart growth principles. The ordinance creates several overlay districts to foster neighborhood identity: Work Live Create, a Neighborhood Commercial Node, Transit Oriented Development, Green Boulevard Corridor, and a Mixed Use Overlay. Each is distinct but all include incentives and regulations that facilitate a mix of uses, diverse housing types, pedestrian scale, connectivity, future transit, open space, increased density, and reduced reliance on cars. This exciting project will revitalize an unused, brownfield site in downtown Moscow, turning it into a vibrant location with a mix of uses. It will bring new housing downtown and closer to services, including the new retail services located in the Jackson Street development. This development stands out by embodying every smart growth principal applicable including historic preservation and adaptive re-use of the grain elevators. The project is a 10 minute walk from the center of the U of I campus and 5 minute walk from Friendship Square, the heart of downtown Moscow making transportation choice one of its strengths. It will link the historic “Hello Walk” on campus to downtown with a pedestrian boulevard. Onsite bike racks and showers will encourage use a nearby bike path connecting the communities of Troy, Moscow and Pullman. A regional transit stop at the edge of the project will be enhanced with a bus shelter, improved lighting and accessibility. The “Hub” is appropriately named for a project whose goal is to create a true downtown for Meridian which rapidly outgrew its rural roots over the last 10 years. This first phase of a larger mixed use project is a 26,000 square foot building slated for pedestrian retail on its ground floor and office space on the 2nd and 3rd floors that will provide Meridian with a gathering place at its urban center. Eighteen foot sidewalks running north and south intersect a thirteen foot east west sidewalk to create an inviting place with planters and trees adjacent to patio seating for residents to enjoy their downtown. The city anticipates that bringing this activity downtown will encourage additional infill and revitalization projects in Meridian’s core. In addition to the pedestrian friendly environment the project encourages bicycling with the inclusion of locker/shower rooms for employees. It is also working with Valley Regional Transit to tie into the planned regional transit system by providing a transit stop on the site. As a LEED CS-GOLD project this building becomes another leader in helping LEED become the new building standard. This home illustrates that “green” home renovation is achievable and affordable. Instead of replacing an existing structure or building a new home in a new further out subdivision this rehabilitation project preserved an existing structure in an existing inner city neighborhood within walking distance to downtown. Demolition materials were re-used in new construction or recycled. Local businesses and craftsman were used in all aspects of the remodel. Heights Home is such an excellent illustration of how to do a green remodel and it is being used for educational purposes both locally and nationally. The home has been the site of many tours for local architects, designers and realtors, including the Idaho Environmental Education Association. 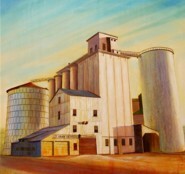 It has been featured on NBC, CBS, http://www.bobvila.com, and in the Idaho Statesman and Idaho Press Tribune. As development pressure has grown in the Treasure Valley, providing affordable housing has become an increasing challenge. 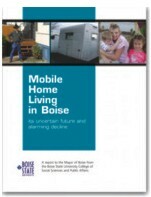 This research project looks at the important role mobile homes play in providing affordable housing and provides policy guidance on the issues of mobile home relocation and redevelopment. In addition to providing affordable housing, mobile home parks create neighborhoods and a sense of place. They offer a close community with the privacy of your own home and small yard. Community and housing diversity are important tenants of smart growth principles. The loss of diverse, affordable housing is an issue that needs to be addressed. This research offers local jurisdictions the necessary tools to understand how to keep mobile home parks as part of the housing mix. This urban infill master planned community housing project on the site of an abandoned hotel stands out for its mix of market-rate housing and community-housing deed restricted units. In partnership with Blaine County Housing authority, Pineridge illustrates that quality affordable green housing is achievable. Passive solar, efficient heating systems and design, and native and drought tolerant landscaping are just some of the green elements in this project. The site plan also preserved several 80 year old pine trees. With a central gathering place including BBQ and playground facilities it creates a sense of place and builds community. Parking is designed to slow traffic and create a buffer for the open space. Located only 1.5 miles from the center of town, the project makes alternative transportation easy with its extensive walking paths connected to a county wide bike path and bus transit. This project shows that with good community involvement and thoughtful design, affordable and denser housing can gain community support. The townhomes on Grand Avenue were selected largely for their location, but also for their design. Located in downtown they provide needed residential close to work and the other amenities downtown Boise has to offer and will help revitalize a part of downtown that is off the beaten path. It is located within walking distance of many uses and amenities including the greenbelt and one of Boise’s large city parks on the river. The design consciously fits within its urban neighborhood providing an enjoyable pedestrian experience. It uses color carefully, creates a courtyard and incorporates superior ADA accessibility. While this project did not achieve its intended goal of providing affordable housing in downtown, prices are still lower than most. Frank Martin – Recognizing outstanding leadership in education and encouragement of smart growth practices in the building industry. The Idaho Smart Growth Board recognizes Frank Martin for his role in building awareness and understanding of smart growth principles in the Treasure Valley and across Idaho. Frank moved to Idaho in 1998 bringing with him the knowledge of putting smart growth into practice from his 26 years of experience in the Chicago area. Frank was instrumental in establishing the Idaho District Council of Urban Land Institute (ULI Idaho) and today serves as its Chair. ULI Idaho has become a strong voice for smart growth throughout the state with the educational forums they have, often open to the public, and the educational work they do directly with the development industry, business community and local governments. Martin’s award winning communities and nationally recognized projects in Illinois include Prairie Crossing, which has often been cited as an outstanding example of smart development. His developments are reflective of his longstanding involvement with ULI where he instigated and served as Chair of ULI’s Sustainable Development Council, chaired six Advisory Service panels and served on three additional panels.